One of the reasons I love Christmas is because it draws all the friends out of their holes in random places all over the world and back to their home her in Newfoundland. This year we were fortunate enough to have our friends from Ottawa, Toronto and even Austraila come home for the holidays. And holidays mean parties and hang outs and lunches. And so we took advantage and spent all kinds of time together. I combined some of those pictures together to create a little grid for this page. I decided to do a little sewing on this page and sewed around the perimeter of the page for something a little extra. 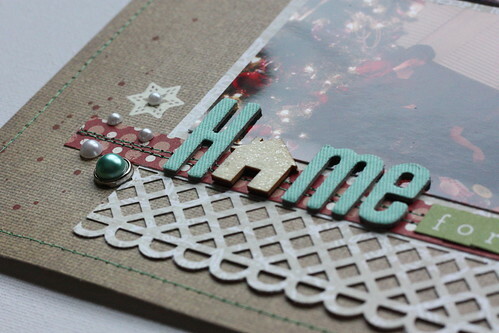 I also wanted to use a little wood veneer house for the 'o' in 'home' but it was just a little too plain. So, I used a little stickles on top to give it a little sparkle. I can't wait to see them all again. Until the next time friends- I'll just scrapbook the memories. Love the house as an "o" in home. And I love how you always get so many pics on a page! What size are your pics? 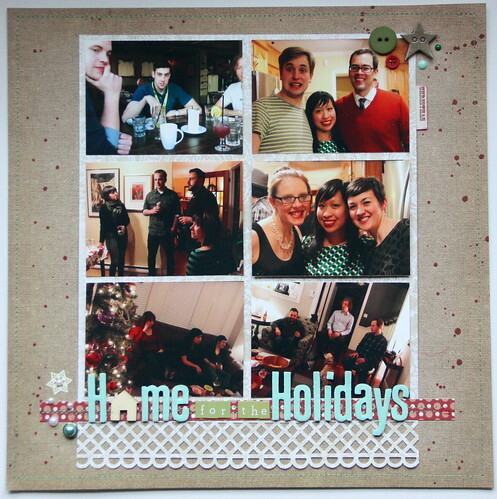 The grid is great but I especially love the border punch at the bottom.